It’s a holiday weekend! Thanksgiving, to be precise, in Canada. So today, Mermaid Music is taking a holiday from the plot to visit a harvest season feast with Whelk’s and Gull’s relatives. The dolphin clan will probably come with some fish, if they don’t eat it all first, and I’m sure the mer-kids’ grumpy auntie will show up with some sea urchins, too. This comic page is sized to use as a desktop image, so feel free to grab it and celebrate with the merfolk! You are welcome to share this image as well as use it for your desktop; please leave it intact with signature and website! Myself, I’m making honey-pumpkin pies and hubby will be making the maple whipped cream! 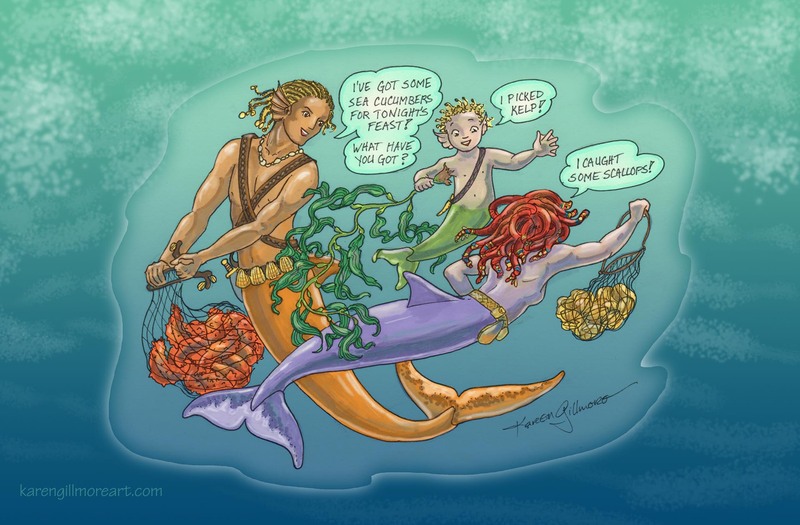 This comic was posted in desktops and downloads and tagged Canadian Thanksgiving, comic, desktop image, feast, merfolk, mermaid, Thanksgiving, undersea.